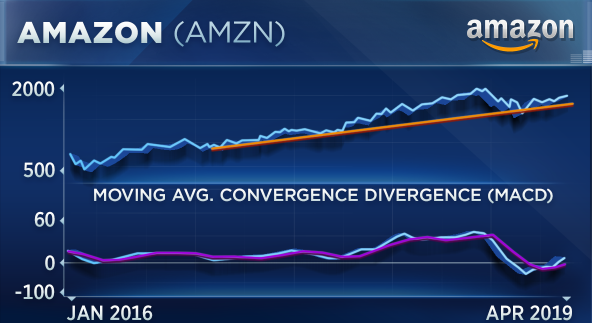 Shares of Amazon are climbing back toward their all-time high of $2,050, and one technical analyst believes the stock may soon reach that level — and then blow through it. Oppenheimer's Ari Wald said Monday on CNBC's "Trading Nation" that after the stock topped $1,730, which had been a key level of resistance, new highs are on the horizon. "We think this is a resumption of the longer term uptrend that's still in play," he said. "Speaking in terms of levels, the near-term breakout through the 200-day is now support at $1,730, and with the resumption of that long-term uptrend, we expect new highs above $2,000 level resistance." Wald also said the broader economic backdrop creates favorable conditions for the e-commerce giant. As global growth slows, he believes investors will continue to place a premium on high-growth, large-cap companies like Amazon. Shares of Amazon gained nearly 2 percent on Monday after Wald's colleagues at Oppenheimer reiterated their outperform rating on the stock, and raised their price target to $2,085. Monday's move brings its gain to roughly 20 percent for the year, and the stock is now about 11 percent from September's all-time high. Chantico Global CEO Gina Sanchez contends that Amazon also looks good from a fundamental perspective, noting that the company's multi-industry dominance should lead to continued growth. "I think that Amazon was one of those companies that put one foot in front of the other for a very long time. And then in 2018, [it] really hit its earnings stride … and now it's threatening industry after industry after industry. So I do think that the fundamental story is very solid for Amazon," she said on the CNBC segment. Sanchez's one issue with Amazon is its valuation. Shares of the Seattle-based company currently trade at 59 times forward earnings, which Sanchez calls its "Achilles' heel." But apart from that, she believes Amazon "has a great story." — Disclosure: Oppenheimer & Co. Inc. makes a market in the securities of AMZN.